Guru Maharaj Ji really intends this world to get into shape. As a result, he doesn't just give us a meditation and leave us to fend for ourselves. He brings us an entire plan of action which clarifies all the details of life and leads to a world society based on brotherly and sisterly love. He provides us with a creative family unequaled in purity and practicality. And he gives us a three fold path - designed to eradicate selfishness as surely as the sun melts snow. 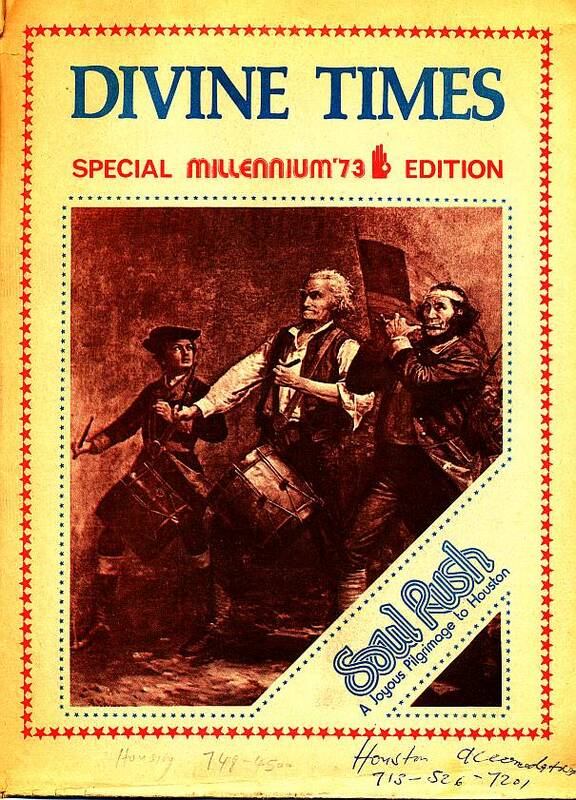 Soul Rush, a pilgrimage for peace and an invitation for all Americans to come to Millennium '73 in Houston, took off with a rousing start in Boston on Oct. 24, then swept on to Plymouth, Philadelphia and Washington D.C. with the message of the advent of real peace on earth. Because we have realized this beautiful Knowledge which is of great bliss to all of us, it is our duty to propogate it to the human race. 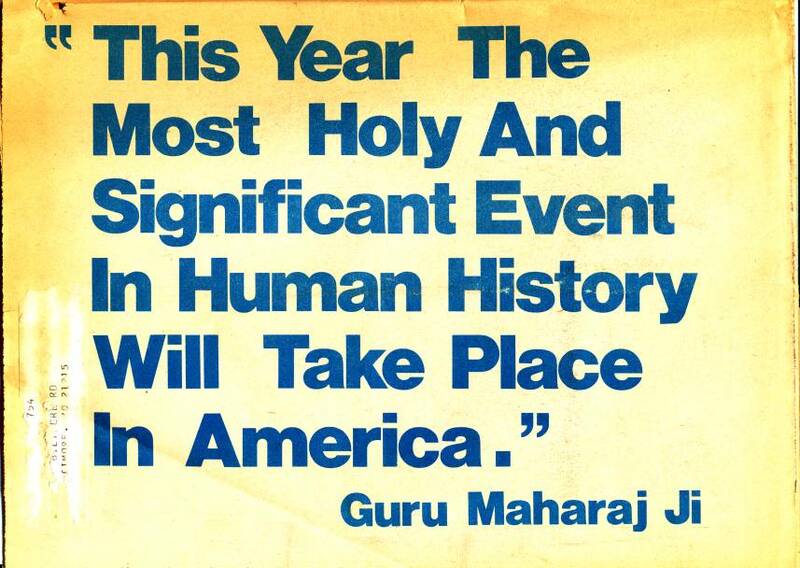 … This year the most Holy and significant event in human history will take place in America. Throughout the 1960's a generation of Americans undertook a biannual journey to Washington, D.C. to demonstrate for peace. Millions came and went, returned and tried time and time again to get the message of peace across. Young and old demonstrated in impressive numbers. They tried many tactics. Finally in exhaustion, they decided that no tactic would succeed. Frustration rather than peace was their reward. 4 Who Is Guru Maharaj Ji? Guru Maharaj Ji had a personal hand in the making of this movie. After we did a first version, which was 60 minutes long, he said that he wanted to do the editing for the final version, so he came out to Los Angeles for one week. This was an incredible experience for us. You see, we have a limited capacity, but Guru Maharaj Ji doesn't, so he really knows how to reach people. … He has brought it to the perfection that we could reach; not that he could reach, but to what was possible for us. Smack dab in the middle of America's musical heritage is an entirely new musical phenomenon waiting to electrify and revolutionize American music history. Blue Aquarius will skyrocket onto the American music scene with the tightest, most diversifed sound that human ears have ever heard! Blue Aquarius is a 50 piece rock orchestra manned entirely by followers of Guru Maharaj Ji. Within the Astrodome on November 8, 9 and 10, Guru Maharaj Ji will present concrete proposals for the creation of the Kingdom of Heaven on earth. Actually, the building may well prove too small for this event. Yet it is the only suitable structure on earth. Thirty jumbo jets from around the world will bring thousands upon thousands of Guru Maharaj Ji's followers to Houston to attend the three-day celebration. Jets from London, Paris, Zurich, Rome, Cologne, Amsterdam, Johannesburg, Kenya, Beruit, India, Nepal, Ceylon, Tokyo, Australia, Peru and Toronto will ferry in his disciples in the largest charter flight movement in aviation history. 12:00 Arti The ancient devotional song of praise to the Perfect Master. 10 Who Is A Perfect Master? So a Perfect Master always manifests himself into this human form. If he comes as a dog, we are going to chain him and put him in our house. If he comes as a cat, we are just going to pet him and that's all. If he comes as a buffalo, we are going to shoot him. That's all. So which is the most appropriate form for him to manifest himself? He does not manifest for cows, for dogs, for sheep and so on; he manifests himself for the human race. And it's not a question that God has manifested himself for one age only. Over centuries and centuries, years and years, ages and ages, God has come here. But, because of our simple ignorance, we couldn't realize him. One night I heard one of Maharaj Ji's apostles or mahatmas give a discourse, the gist of which was that God was energy that could be directly experienced by human beings inside as light, sound, feeling and taste. This mahatma said he could transmit this Knowledge to people who wanted to know it bad enough. I decided to give it a try because it didn't cost anything, and I couldn't figure out any way I could lose, except maybe a few hours of my time. Blessings and peace to you. It fills my heart to announce that our Mission is expanding, knowing no bounds. As you all know, in the United States of America, a great celebration is to take place on the 8th, 9th, and 10th of November. I had everything, I never hungered, never saw pain. When I became about twelve I began to see the daily pain others bore in the world. So like Buddha, my heart set out on a search. I looked everywhere. I became a loving vandal. I cut the sleeves off my school blazer and wore it as a ragged vest. The other children around me were with me. We have been let in on a secret. And the whole purpose of Divine Light Mission is to let everyone in on this secret, for once this happens, peace will be established on earth! The secret is that there is concrete proof that the Lord is walking on this planet today! In July of 1966, Shri Mata Ji spoke publicly for the first time. Through tears at the loss of Shri Maharaj Ji, Mata Ji promised to carry on the Master's mission. Since that time, she has travelled continuously, propogating the Knowledge of internal communion with Truth revealed by the Perfect Master. Divine Light Mission in the U.S.A. This year the most Holy and significant event in human history will take place in America.